Get your ads on GSD Smart Ads Today! Welcome Advertisers to GSD Smart Ads! Don't Have A Banner? We can help you! Relax. Our Banner ads work for you. Want to grow your business? Put your message in front of potential German Shepherd Dog customer's when they visit GSDsite.com - No wasted costly impressions. No Key Word Bidding! Wow! All Banners Are Displayed in Industry Recognized Hot Spots. Link your Banner Advertising to your Web Site or Facebook Page! We do not allow Publishers that will post your banner(s) on non-relevant sites that cost you money from curious non-interested people like the other big banner sites. Benefit from this great opportunity to promote your German Shepherd Dog sites, Facebook Pages, German Shepherd products and services to a wide German Shepherd Dog audience of potential customers. We Are Affordable and also Have Great Package Options! Option 1 - Add $50.00 and receive a 30% Bonus - Total Bonus credit of $15.00 - You Pay $50.00 and receive $65.00 in advertising. Option 2 - Add $75.00 and receive a 40% Bonus - Total Bonus credit of $30.00 - You Pay $75.00 and receive $105.00 in advertising. Option 3 - Add $100.00 and receive a 75% Bonus - Total Bonus Credit of $75.00 - You Pay $100.00 and receive $175.00 in advertising. Option 4 - Add $200 and receive a 80% Bonus - Total Bonus credit of $160.00 - You pay $200.00 and receive $360.00 in advertising. 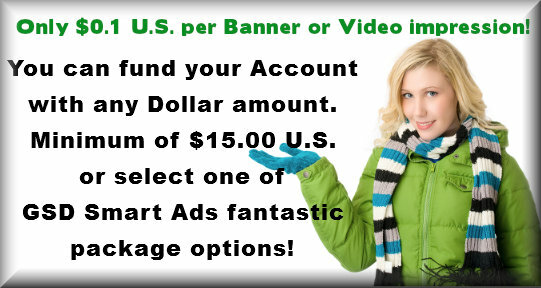 Let's get started creating your GSD Smart Ads Banner account.